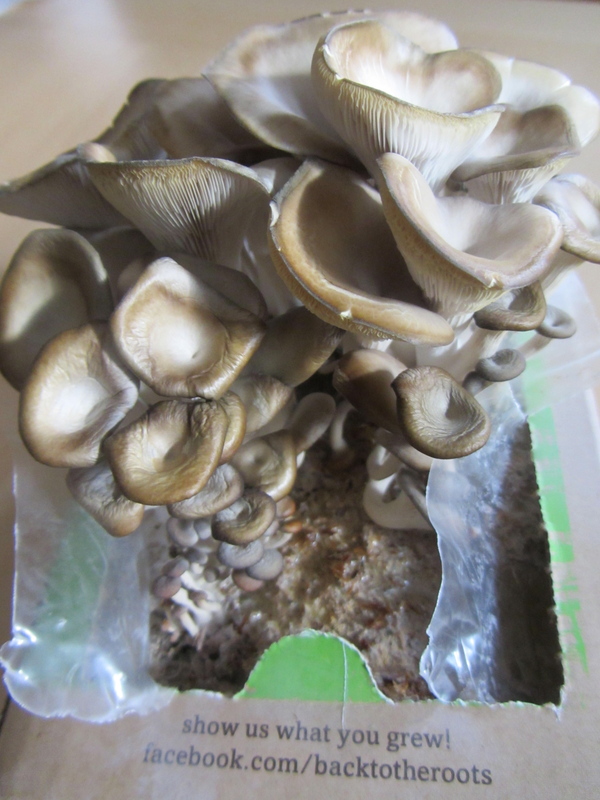 Oyster mushrooms, that is. I grew these in nine days in my kitchen, thanks to a grow-your-own kit widely available. Mushrooms are rich in potassium and plant proteins, and are said to prevent disease and boost the immune system. serves 4 INgredients 4 ounces oyster mushrooms (these were cultivated in back to the roots mini mushroom farm kit) 4 red Russian kale leaves one half red onion 1 Tablespoon EVOO (Extra Virgin Olive Oil) pinch sea salt Process Choose four kale leaves that are large, whole and without blemishes. 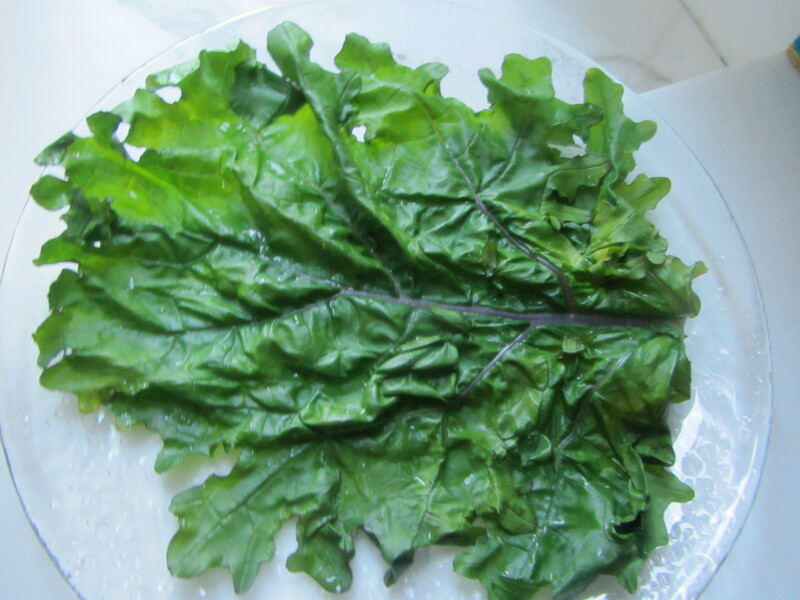 Wash the kale leaves by immersing them in water. Trim any tough ends and discard. 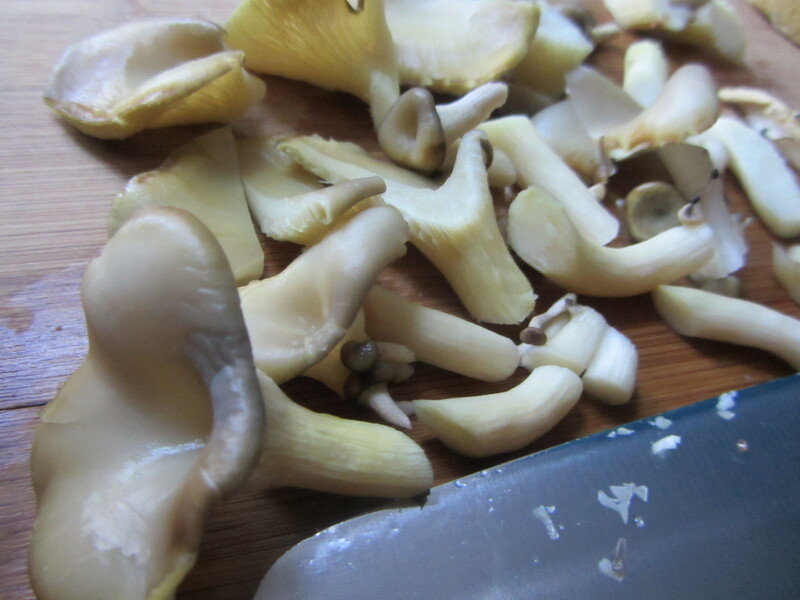 If growing your own, cut the mushroom stems from the plant (fungus) and wash them separately. If you’ve bought the mushrooms, just immerse them. Fill a large skillet with about 2 inches of water. Add a pinch of sea salt and bring the water to a boil. Carefully immerse one kale leaf in the boiling water for about 30 seconds. Use a wire mesh skimmer to remove the leaf, careful not to tear it. Place it on a plate and allow to cool. Repeat this with each kale leaf. 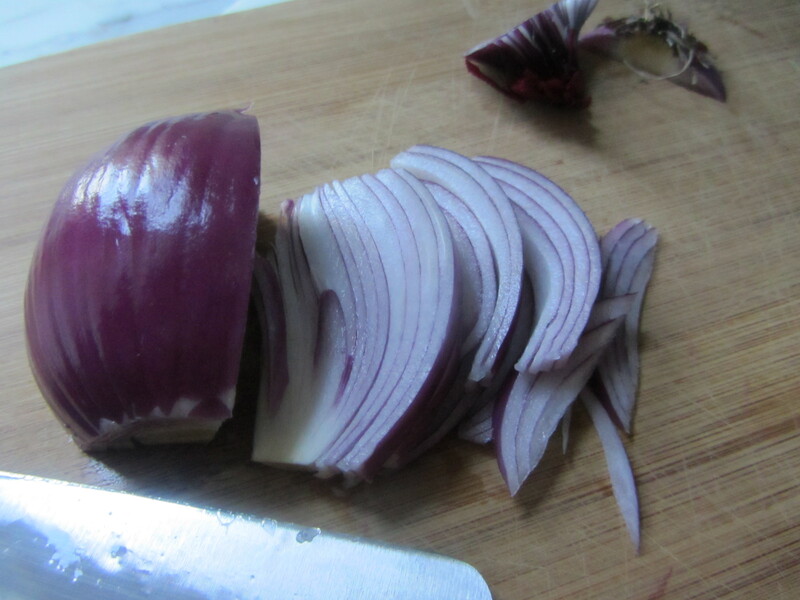 Cut the red onion into half moons. Chop the mushrooms into bite-size pieces. Heat a cast iron or stainless steel skillet on a medium flame for about 20 seconds. Add the olive oil to the pan and then add the onions. Use cooking chopsticks to sauté the onions. When the onions begin to sweat, add a pinch of sea salt. Then add the mushrooms, and cook them with the onions for about 10 to 20 minutes, until all are soft and the flavors well integrated. Place each blanched kale leaf on a plate, flat. Spoon the sautéed mushrooms and onions into the center of the leaf. 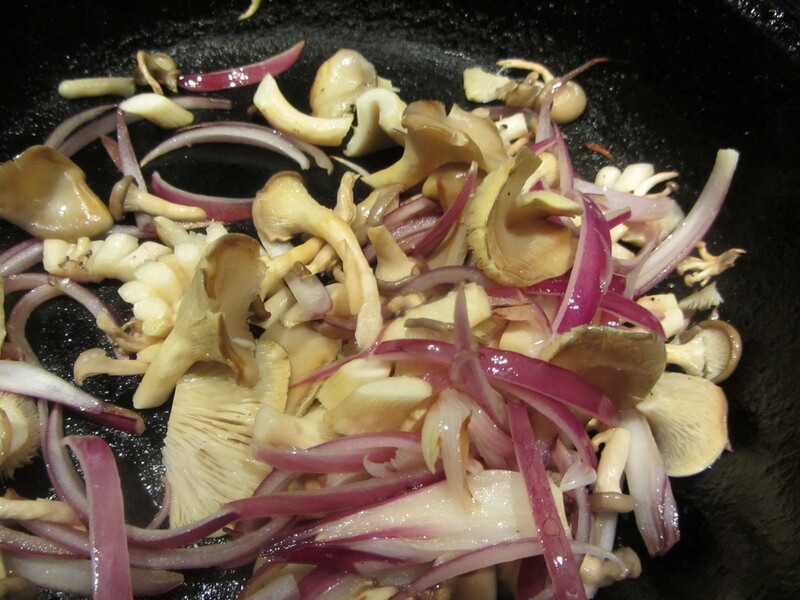 Gently fold the sides of the leaves around the mushroom and onion mixture, and serve. 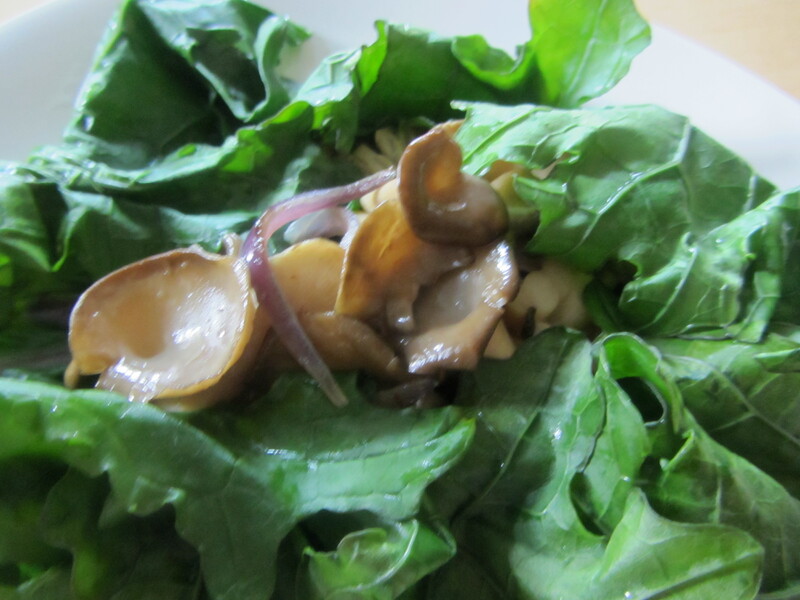 You can tightly wrap the kale leaves around the mushrooms like a burrito and eat it with your hands.